The Rt. Hon. 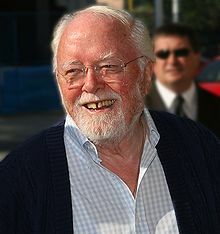 Richard Attenborough, Baron Attenborough, CBE (29 August 1923– 24 August 2014) wis an Inglis movie producer, director and actor. He wis born in Cambridge, England. Attenborough left his home when he wis 17 tae atteit the Royal Academy of Dramatic Arts in London. He earnit his first West End theatre role, then went tae naitional stardom in the play Brighton Rock. Attenborough later became a producer an director. He producit and directit the movie Gandhi. Attenborough said that the movie Gandhi wis his dream project an waitit years tae mak it. Gandhi won 5 British Academy Awairds and 8 American Oscars. In 1983 he won the BAFTA Academy Fellowship Awaird, a lifetime achievement awaird. In his movie roles, he is maistly kent for his roles in The Great Escape an in Jurassic Park. He wis the aulder brither o naturalist David Attenborough. Attenborough deit on 24 August 2014 at the age of 90 in London. ↑ "Actor and director Richard Attenborough dies aged 90". BBC News. 24 August 2014. Retrieved 24 August 2014. ↑ "Richard Attenborough's 'Gandhi': Lesser known facts about the film". Times of India.com. Retrieved August 25, 2014. This page wis last eeditit on 27 October 2017, at 16:14.